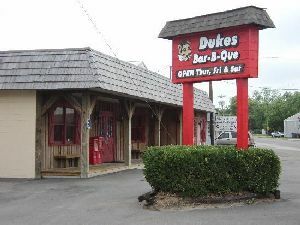 Southern style BBQ restaurant, has been on the FOOD NETWORK “My Favorite Place To Eat” episode. Buffet style inside with a drive-through window. Their BBQ pork is moist and tender with a sweet and tangy sauce (mild or hot) to pour over. Great job with the country cooking. All the vegetables are seasoned very well, great hushpuppies and banana pudding, chocolate cake and peach cobbler to finish it off with. They are located about 5 miles of I-95. (Exit 56). Great place to take a break from driving and enjoy lunch or dinner. Adult buffet was $9.00, (9/4/10) good deal, great job folks!! !